Four and a half miles into my run and I’m jumping from side to side over the slippery mud track of the Cornwall coastal path, drenched from the past week’s irascible and unpredictable showers. I’ve nearly slipped off the path once, about two miles in, with a hundred-foot drop beckoning—more a tumble into bramble than sheer cliff, but worth avoiding just the same. I take a quick glimpse to my right. There: the glittering sea, two tankers and a cruiser waiting for refuelling, half not there at the waterline in the haze of heat. The levelness of the ocean is like a nod from my granddad: you’re alright, get on, go on with you. There’s hardly anyone else on the path—the morning’s heavy downpour saw to that, although now it’s turned sunny—that pinpoint spring blaze that surprises as the sun fizzes out from the clouds. Yesterday’s 40mph gales have settled into more subdued bluster. What I’m jumping around and over and almost waddling through (a scene from one of those 80s overcoming-the-odds films: a double row of tires on the assault course) is the caramel-coloured aftermath underfoot of a wet weekend on the southerly-most point of Britain. Every time I put my foot down, the ground under me slips sideways six seven inches. It’s as if I’m running on silk. Bobbly silk, granted. I’m leaping across puddles that cover the whole path; I’m jumbling left right left over half-buried stone and slate; over mounds of trodden clay and lichen-covered branches that blew off in the storms and lie in the middle of the path like lost crooked legs. And I know I could fall at any moment, but I don’t slow down. I go faster. The major slip earlier, the one that nearly took me over the edge, flinched me in exactly the spot of the fatigue that I’ve been carrying around, from the middle of my spine through the left shoulder blade and neck as I shot out an arm to balance, and shifted something: set it loose and free. The climber Douglas Scott has felt it on higher and dangerous mountains: “We were frequently right on the edge and at the limits of our endurance. It is then that areas of our being that are normally hidden are revealed.” Being somewhere near an edge, and tending to the danger, but taking it on, going faster. It has dislodged what I’d held too close in my shoulders and arm, something hidden about myself: the loci of my fatigue. I jump across a wide puddle. I feel the tug on my hip flexor not in the landing leg, but in the leg I jumped off. But the six weeks of nothing but stretching, nothing but core stability, has done its work. I feel it, but it goes. I jar my left ankle on a stiff angled rock, coming out of the path like the end of a buried book, spine out. I feel the flexor, but it’s not injured. It’s strengthening. I go on. I go faster. I taste salt on my top lip. I think: I’m flying. It’s here, on the return of this six mile run, the first serious run since injury, that I realise I’ve stopped counting how far I’ve run. I’m not noticing the distance or how far to go. I’m just running. Not for a race. Not to get fit. Not to get anything or anywhere. And the fear that took me back to bed that same morning, only four hours earlier, the fatigue I’d carried in my shoulders since I’d burnt out two months earlier and couldn’t write one more single sentence, couldn’t even go out for a walk, the fear that crippled me almost as soon as I’d gotten up and then given up and thought: I can’t do this, I can’t do this, was gone. Just gone. It had tumbled over the edge of the coastal path as it had left my shoulders and run down my arm. In steadying myself to run faster I had flicked it out and away, into the great sea, down below. I knew running would save me that morning. It always has. It was no coincidence that in March this year I stopped running at the same time that I stopped writing. Both were injuries that meant I had to ‘give up’. For running, it was my calves. For writing, my head. I sat down at the laptop one morning after what Irvine Welsh calls a ‘binge’ of writing (a highly productive binge) and stared at it for 21 minutes before closing the laptop again, and I haven’t really been able to write anything of significance since. And I hadn’t been able to run, either. For my running, this was a blessing. I’d reached a point where I was too frustrated with always getting injured. So I went to a physiotherapist, Steve, who diagnosed a misaligned pelvis, weak core, and underdeveloped hip flexor and calf muscles. Rather than run, I was instructed to stretch properly every day, and to exercise my core. Like most semi-serious runners, I already knew this. Unlike most serious runners, I ignored it. But I was fed up of getting injured. So this time, I did what I was told. Stretching every morning, sometimes twice a day, and doing it properly (a minute each stretch, and the sciatic nerve twice a day in quick bursts). And focusing on the core, static strength exercises, five or six times a week. And the result: flying. But I’ve not yet been able to do the same with the other injury. The head. The writing muscle. Somehow I’ve still not worked out how to strengthen it properly, and give it good rest. That morning. And I thought things were getting better. But as Colin Espie, head of the Glasgow Sleep Centre, writes in his book Overcoming Insomnia, recovery from long-term chronic insomnia is an ‘uneven path’. This was my second sweep at the programme. The first, between May and August 2011, had worked. It took me from being a bad sleeper to an average one. That was a success. But it’s easy to fall back. That morning. I got up at 602am, like every morning, got up, did my half hour of stretching, had breakfast, but didn’t feel right. Still felt too tired. So short of sleep. An average of 5hrs 42minutes last week. This week, improved: 6hrs 15m so far. But it’s not restorative. Not always restorative. Sitting at the breakfast table with S, I was short tempered. Fatigued already. Already annoyed that I could not get out for the run at 7am, as I’d promised I would (promised who? My perfect self, that’s who). But what could I do? I couldn’t go back to bed: not allowed. So I put my shoes on, packed up my laptop and books, and readied myself to go out. S told me about a new vegetarian cafe. Turn left not right out of the house. Down the first steps, then right, or was it left? I don’t listen: I’m not going to go there. He’s telling me another way. I say it’s a small town, just tell me where it is off the high-street. He sees my short-temperedness, is annoyed. But he shrugs it off, is immediately calm and friendly as he says goodbye. I leave and turn right, like every morning. And then in the cafe, I’ve no clarity on what I’m doing there. No purpose. It’s what I do every morning, get up, go out, write. For two months it worked well. And then—too many words. Too many projects piled up one on the other. Two hundred thousand words in two months. A hundred thousand words a month. Book chapter, article, essay, project, half the novel, flash pieces, morning pages. Not counting the emails, the teaching preparation, the getting-out-ofs, the corrections. I try just writing the morning pages, the messy and unfettered and unedited journaling that Natalie Goldberg and Brenda Ueland and Joanna Field all recommend; the letters that John Steinbeck wrote on the left hand side of the book in which he wrote East of Eden on the right. Despite all of these precursors, all of these successes, all of these expert guides, I look at what I’m doing and think: pointless. Useless. I struggle on for eighty-one minutes. The frustration is deadening. I feel it as a physical fatigue clamped into my back. Then a short lift: the caffeine, some email and Facebook communication. Then a plunge: a contemporary announces the publisher deal for his second novel. I close the laptop. I pack away my stuff, I can’t breathe into my belly, just a high, anxious grasping of air into the chest lungs. I lunge out of the cafe, left, left, left again, up Jacob’s ladder, and into the house. I kick off my shoes, they fly along the corridor, I tramp upstairs without even taking off my coat and climb into bed with the last forty pages of Never Let Me Go to read. Don’t do it, I say to the book and its imaginary world which is just as real if not more real than my own. Don’t do it to them. I lay there, afraid of getting up. Afraid that I’ve wasted too much of my life. Afraid I’m not good enough to write. The fear is heavier than the duvet. It’s the thing I can’t lift up. I finish the book and I close my eyes and I cry. Just one tear, two. This is the worst it’s been for a long time. I need to tell G that I’m suffering from significant depression. That it’s been the same every April and May for the last four years, perhaps earlier, some form of dissolution at the time of my father’s birthday. That I’m not a safe bet. I’ve written emails to her three, four times but not sent them, asking her to let this one go. Nothing depresses me more than that. So I think of Kathy and Tommy and Ruth in Never Let Me Go. “Poor creatures,” Madame calls them. “Poor creatures.” A life set out for them as cloned human donors. No parents, only guardians. Kept always in the dark until their bodies are stripped of every usable organ. They never even consider resisting. Without any choice of how to live and grow old. And that’s when I get up. Flying. It lasted for maybe half-a-mile, maybe not even that. But it was enough. At some level, I know it’s chemical: the endorphins rushing through my brain as the physical activity of running boosts my immune system, lifts the depressive mood and the physical exertion takes me out of the cycle of rumination, the closed circle of non-awareness that comes with anxiety and depression. But that’s ok. I’ll take it. I’ll take whatever I can get. What I’ll also take is the feeling that my legs and core are strong. I said to K a few weeks ago that I wanted to run for ever: for the rest of my life. And if I wanted to do that, I would need to take it all seriously. Grown-up. Stretching, core, diet. This was the first run of my life when I knew I would run all my life. And if I am running my life—well, the metaphor says it all. It isn’t running me. I want to write all my life too. How to solve the deeper muscle trauma? What rest, what stretch? How to build up the endurance? And there, just as I turn off the coastal path at Swanpool for the short stretch of road before it begins again, climbing up for the round-cliff stretch to Gyllgynvase, I see it, him, her: my first swallow of the summer! It swoops below a bush and then back up again. I follow it and watch it come to land on the edge of the outside bin area of the Indaba restaurant, where its partner, I suppose, is already resting. I stop, lift up onto my tiptoes, pause my Garmin, put a hand over my eyes to shade the sun, and stand for a moment watching. 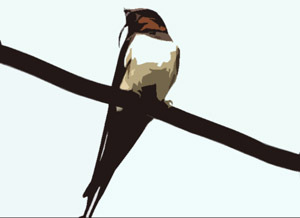 The first swallows, all the way from Africa. My six miles seems inconsequential. Good. They are. It’s not my distance travelled in miles that I need to measure. I stand watching. I’m desperate to keep running, but I also want to watch the swallows fly just once more. They look around as if weighing up the situation. Their white bellies heaving under dark, deep blue heads. That word heaving. I’d written it down earlier in the morning in the cafe, a slip of the pen, I thought at the time, as I’d meant to write heaven: ‘the mind can make a heaven of hell, or a hell of heaven’. I’d written heaving instead of heaven. I’ve been heaving around a lot of baggage—literally and metaphorically—taking my laptop with me everywhere, to write, even if I couldn’t. Even if my mind had given up. Making a hell of heaving. Then one swallow dips down and up into the eaves of the restaurant. Good, I think, they’ve found their home. They’ve come back to it. And I think the other swallow will follow, but it dips down and then over my head and up into the sky and does a circle first, before coming down and swooping up into the eaves to disappear. And as I’m coming back I know I’m doing a Louis, ending too fast, should keep the even pace of the run, but I don’t care. I don’t think of slowing down. I run on, Swanpool far behind me now, coming into the narrow concreted path that leads down to Gyllgynvase beach, and I’m shouting for a group of three lads to get out of the way, only too late seeing that the one in front is being cared for by the other two, that he has learning difficulties or some disability, and I just miss him as I twist past, still unable to slow down. And then I’m pounding past the final family, mother father two daughters, and onto the flat, and then onto the beach, and the sun is fully out, it’s midday, and the sea is a-glimmer, and I run over the shingle and blood-red seaweed drying like ringlets of radicchio pasta in a thick tidal line, and I’m kicking off my trainers and pulling off the socks that are worn away at the in-step and left me with blisters (blisters! Blissters… I’m running again, I was afraid I couldn’t) and I’m walking into the sea. Freezing ankles, then up and over the calves and the knees, and the gentle waves that look barely ripples from a distance are suddenly much larger, more powerful, but still easily waded through, and my hands are up on my head as the cold starts to take my bones, but I know, guess, can already feel the swelling being taken out of my muscles by the brine and bream. I keep walking to ward off the worst of the cold, until four or five minutes in, and I start to get used to it, and can stand still and enjoy the air and the glimmer and the peace.